Have you ever need an extreme experience and speed on the surface of the water? 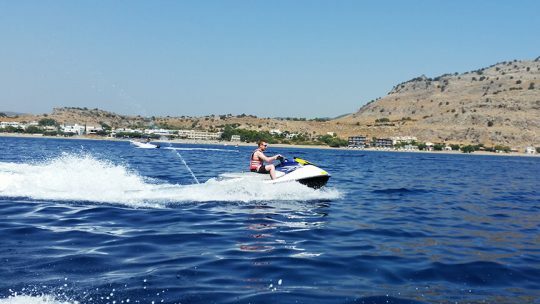 Then Action Water Sports in Rhodes is the ideal place to hire an extremely fast jet ski! Try our new 130HP Sea-Doo GTi 130 iBR jet ski with brake and reverse or the new 110HP Yamaha WaveRunner! Our specially trained and experienced staff will teach you how to operate and inform you of the required safety procedures. Also a market area with buoys will provide you the safety to run at maximum speed!!! Not enough? 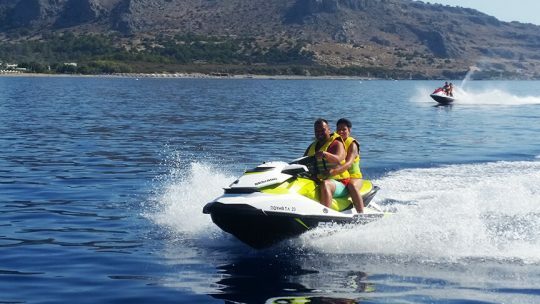 Check out our safari jet ski in Rhodes for an unforgettable jet ski ride!!!!! What are the age requirements to rent, drive or ride a jet ski? You must be 16 year of age or older with a picture ID to drive, 18 years or older to rent and any age may ride. Do you provide instruction on how to drive the jet ski? Yes, we provide instructions for jet skiing. No experience is required. Our company policy requires trained activity coordinators to provide safety instructions and training to everyone regardless of their experience. There is a marked area with buoys in the water where you can drive your Jet Skis. The distance between the buoys is enough to run on maximum speed and enjoy your ride. 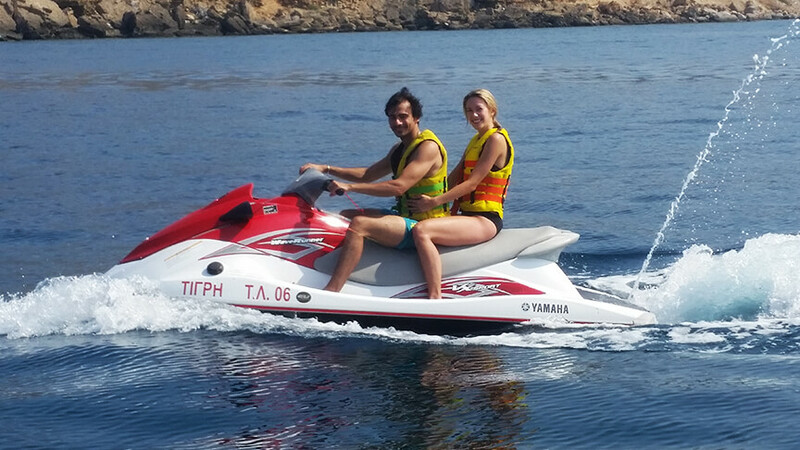 If you want to drive far from the beach, please check our Safari Jet Ski activity. How many Jet skis do you have? How many can we rent at the same time? 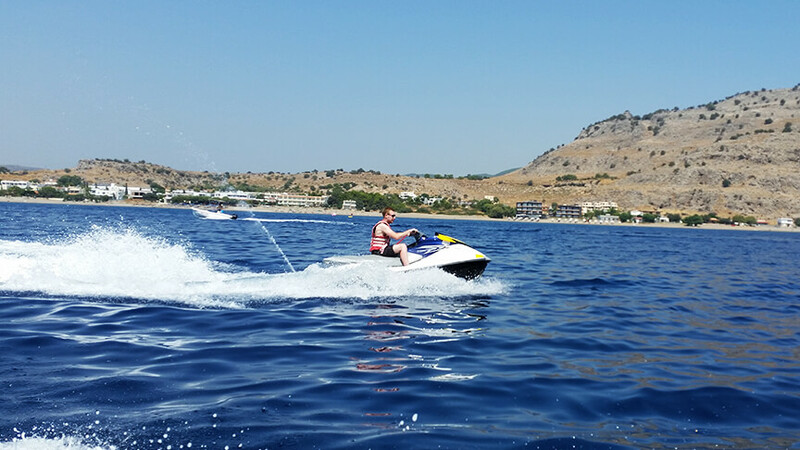 We have 4 jet skis at Rodos Water Sports Action, 2 Sea Doo GTi and 2 Yamaha Waverunners. 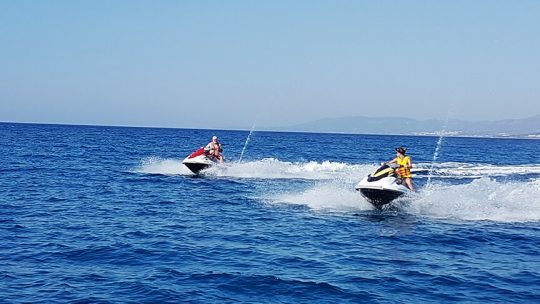 You can rent maximum 2 jet skis at the same time, due to safety rules given by the port police. 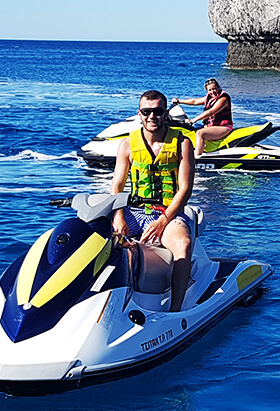 3 Jet skis can go out at the same time on special occasions. Please contact the staff for more information. How fast will the Jet skis go? Speed depends on the water condition (How choppy the water is due to wind and waves) and the total weight onboard. One person on a jet ski will obviously go faster than three people on board. 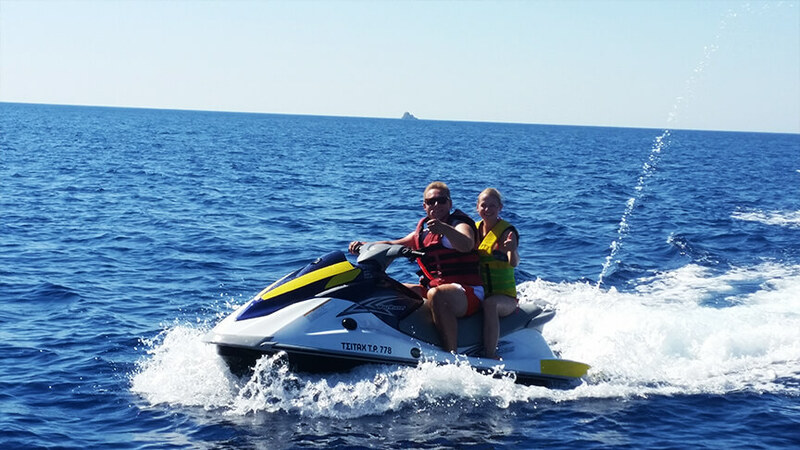 Our Jet Skis are capable of going over 55 miles per hour, and on the water - that's fast! You don't have to go fast of course, but if you want to, our exclusive riding area allows enough freedom to keep your machine full-throttle for the entire ride! You can return to the dock and switch riders during your rental time or switch drivers on the same jet ski on the water. No switching from one jet ski to another jet ski due to safety reasons. Some people like their smooth without waves and others like it wild with big waves. At Lardos beach, usually the sea is calm till 14:00-15:00 and then it get's more choppy. Great team! We had a lot of fun, Nikos and his team are very professional. We did jet-ski, parasailing and water ski, thanks to Nikos our kids learned waterski. I will try wakeboard again next year We definitely recommend. Excellent, we have only just done the jet skis and would recommend to everyone the staff are really friendly and helpful. Thank you guys! The only water action place on Rhodos that was answering e-mails. Very friendly team. Everything was super. Husband and my 6 year old daughter loved the ride on the jet ski! Thank you very much. The video is amazing! !